Project obstacles and solutions: Don Hennessee of Morrison, Tennessee was building a large detached garage at his residence. The building included two levels, with the lower level below ground. Stockton Concrete was contracted to pour all of the walls and lower-level floors of the garage. 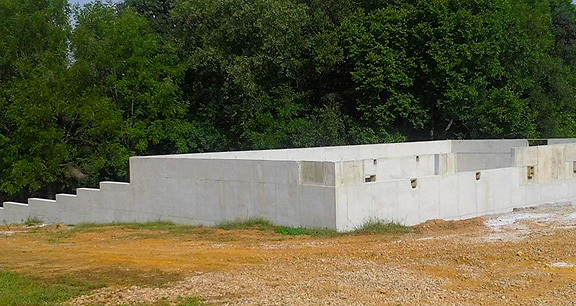 Wendell Stockton of Stockton Concrete turned to IMI to supply 100 yards of imix EZ Wall. This mix is designed specifically for residential walls. Stockton had used the product on a number of other projects. However, IMI QC/QA had made improvements to the mix to make it easier to handle during a pour. In particular, imix EZ Wall fills the forms completely and quickly. It is designed to flow with minimal interaction from the finishers. It is also designed to reduce rubbing once the forms come down. Stockton uncovered a very smooth wall across the entire basement. For more information on imix EZ Wall, click here.